Bruce Sugden brings us this dour scenario, representing the last of our “Sacking of Rome” series. With its precision-strike complex, the United States has conducted conventional strikes on enemy homelands without fear of an in-kind response. Foreign military developments, however, might soon enable enemy long-range conventional strikes against the U.S. homeland. China’s January 2014 test of a hypersonic vehicle, which was boosted by an intercontinental ballistic missile (ICBM), suggests that it has designs on deploying a long-range conventional strike capability akin to the U.S. prompt global strike development effort. If China pushes forward with deployment of a robust long-range conventional strike capability, within 20 years Americans could expect to see the U.S. homeland come under kinetic attack as a result of U.S. intervention in a conflict in the western Pacific region. With conventional power projection capabilities of its own and a secure second-strike nuclear force, China might replace the United States as the preponderant power in East Asia. The implication of Chinese long-range strike is that U.S. military assets and supporting infrastructure in the deep rear, an area that is for the most part undefended, will be vulnerable to enemy conventional strikes—a vulnerability that U.S. forces have not had to deal with since the Second World War. Furthermore, China would be tempted to leverage its long-range strike capabilities against vital non-military assets, such as power generation facilities and network junctions, major port facilities, and factories that would produce munitions and parts to sustain a protracted U.S. military campaign. The American people and the U.S. government will have to prepare themselves for a type of warfare that they have never experienced before. What we have become familiar with in the conduct of conventional precision-strike warfare since 1991 has been the U.S. use of force in major combat operations. The U.S. precision-strike complex is a battle network, or system, of intelligence surveillance, and reconnaissance (ISR) sensors designed to detect and track enemy forces and facilities, weapons systems to deliver munitions over extended range (e.g., bombers from the U.S. homeland) with high accuracy, and connectivity to command, control, communications, and computers (C4) organized to compress the time span between detection of a target and engagement of that target. Since the 1990s weapons delivery accuracies have been enhanced by linking the guidance systems with a space-based positioning, navigation, and timing (PNT) system. China’s People’s Liberation Army (PLA) has studied the employment of the U.S. precision-strike complex and has been building its own for years. Since the 1990s, China has been increasing the number of deployed short- and medium-range ballistic missiles, many of which U.S. observers tend to believe are armed with conventional warheads. China has also been improving the accuracies of its missiles by linking many of them to its space-based PNT system, Beidou. In addition, the PLA has been deploying several types of land-attack and anti-ship cruise missile systems. These weapons systems are part of a layered defense approach that the PLA has adopted to keep foreign military forces, mainly U.S. forces, outside of China’s sphere of interest. There are indications that China is expanding its precision-strike complex to reach targets further away from Chinese territory and waters. First, as the most recent DOD report on Chinese military power notes, China is developing an intermediate-range (roughly 3,000-5,000 kilometers) ballistic missile that could reach targets in the Second Island Chain, such as U.S. military facilities on Guam, and might also be capable of striking mobile targets at sea, such as U.S. aircraft carriers. Second, the PLA Air Force has developed the H-6K bomber, which might have a combat radius of up to 3,500 kilometers and be able to carry up to six land-attack cruise missiles. 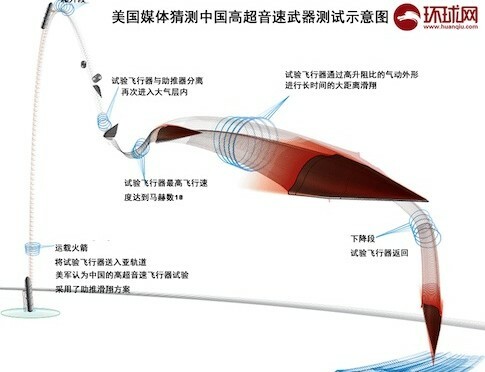 Third, as mentioned above, China has tested a hypersonic vehicle using an ICBM. China’s attraction to hypersonic technologies seems to be related to U.S. missile defenses. As many U.S. experts have believed since the 1960s, when the United States first conducted research and development on hypersonic vehicles, such delivery systems provide the speed and maneuverability to circumvent missile defenses. These characteristics enable hypersonic vehicles to complicate missile tracking and engagement radar systems’ attempts to obtain a firing solution for interceptors. Although we cannot be certain about how a future military conflict between the United States and China might develop, the ongoing debate over the U.S. Air-Sea Battle concept suggests that alternative approaches to employing U.S. military force against China could persuade the Chinese leadership to order conventional strikes against targets in the U.S. homeland. On the one hand, in response to PLA aggression in the East or South China Seas, an aggressive forward U.S. military posture would include conventional strikes against targets on the Chinese mainland, such as air defense systems, airfields and missile operating locations from which PLA attacks originated, C4 and sensor nodes linked to PLA precision-strike systems, and PLA Navy (PLAN) facilities and ships. These strikes would threaten to weaken PLA military capabilities and raise the ire of the Chinese public and leadership. Even assuming that China opened hostilities with conventional missile strikes against U.S. forces at sea and on U.S. and allied territories (Guam and Japan, respectively) to forestall operations against the PLA, the Chinese public and the PLA might pressure the leadership to respond with similar strikes against the U.S. homeland. A less aggressive U.S. military posture, on the other hand, such as implementation of a distant blockade, would focus military resources on choking off China’s importation of energy supplies and denying PLA forces access to the air and seas within the First Island Chain. While this approach might play to the asymmetric advantages of the U.S. military over the PLA, the threat of being cut off from its seaborne energy supplies over an extended period of time might convince Beijing that it needed to reach out and touch the United States in ways that might quickly persuade it to end the blockade. The PLA’s ideal targets might include low density/high demand military assets, major power generation sites, key economic and political centers, and war-supporting industry. More specifically, with U.S. forces conducting strikes against PLA assets on mainland China, sinking PLAN ships at sea, and blocking energy shipments to China, PLA military planners might be tempted to strike particular fixed targets to weaken U.S. power projection and political will: Whiteman Air Force Base, home of the B-2A bombers; naval facilities and pierside aircraft carriers at San Diego and Kitsap; facilities and pierside submarines at Bangor; space launch facilities at Vandenberg Air Force Base and Cape Canaveral; Lockheed Martin’s joint air-to-surface stand-off missile (JASSM) factory in Troy, Alabama; Travis Air Force Base, where many transport aircraft are based; and major oil refineries in Texas to squeeze the U.S. economy. It is plausible that Chinese conventional precision strikes against targets in the U.S. homeland would set in train several operational and strategic effects. First, scarce military resources could be damaged and rendered inoperable for significant periods of time, or destroyed. Whether at Whiteman Air Force Base or the west coast naval bases, such losses would impair the conduct of U.S. operations against China. Furthermore, damaged or destroyed munitions factories, logistics nodes, and space launch facilities would undermine the ability of the U.S. military to conduct a protracted war by replenishing forward-deployed forces and replacing lost equipment. The U.S. military might have to re-deploy significant numbers of forces from other regions, such as Europe and the Persian Gulf. Second, the American people, if they believed that fighting in East Asia was not worth the cost of attacks against the homeland, might turn against the war effort and the politicians that supported it. Even if a majority of Americans were to remain steadfast in support of the war, however, public opinion would not protect critical assets from being struck by Chinese conventional precision strikes. Third, the operational effects might sow doubt in the minds of U.S. allies about the survivability and effectiveness of the U.S. power projection chain, while American protests in the streets against the U.S. government would undermine allies’ confidence in the resolve of the United States. If the allies judged that the United States lacked the capability or the will to wage war across the Pacific Ocean against China, then they might accommodate China and cut military ties with the United States. The loss of these military alliances, moreover, could result in the disintegration of the international order that the United States has built and sustained with military might for decades. Fourth, facing damage from strikes against the homeland and perhaps lacking the conventional military means to defend its allies and achieve its war aims, the United States might have to choose between defeat in East Asia or escalation to the use of nuclear weapons to fulfill its security guarantees. U.S. nuclear strikes, of course, might elicit a Chinese nuclear response. Three approaches come to mind that might mitigate the effects of conventional strikes and, perhaps, dissuade China from expending weapons against the U.S. homeland. The development of less costly but more advanced missile defense technologies that could be deployed in large quantities could protect critical assets. The technologies might remain beyond our grasp, however. Directed energy weapons, for example, would still need to find and track the incoming target for an extended period of time, and then maintain the laser beam on one point on the target to burn through it. If missile guidance systems remained tied to space-based PNT in the 2030s, then ground-based jammers might be able to divert incoming hypersonic vehicles off course. Without accurate weapons delivery, the conventional warheads would be less effective against even soft targets. Future onboard navigation systems, however, might enable precise weapons deliveries that would be unaffected by jamming. The final and possibly most effective approach takes a page from China’s playbook: disperse and bury key assets and provide hardened, overhead protection for parked aircraft and pierside ships. Because burying some facilities would be cost prohibitive, another protective measure might be to construct hardened shelters (including top covers) around surface installations like industrial infrastructure and munitions factories (though this measure might be cost prohibitive as well). This preliminary discussion suggests that cost-effective remedies are infeasible over the next few years, yet the threat of distant conventional military operations extending to the U.S. homeland will likely continue to grow. Therefore, more comprehensive analysis of active and passive defenses as well as other forms of damage limitation is needed to enable senior leaders to make prudent investment decisions on defense and homeland security preparedness against the backdrop of a potential conflict between the United States and China. Bruce Sugden is a defense analyst at Scitor Corporation in Arlington, Virginia. His opinions are his own and do not represent those of his employer or clients. He thanks Matthew Hallex for valuable comments on earlier drafts of this essay. On China’s January 2014 test of a hypersonic vehicle, see Benjamin Shreer, “The Strategic Implications of China’s Hypersonic Missile Test,” The Strategist, The Australian Strategic Policy Institute Blog, January 28, 2014; on the U.S. prompt global strike initiative, see Bruce M. Sugden, “Speed Kills: Analyzing the Deployment of Conventional Ballistic Missiles,” International Security, Vol. 34, No. 1 (Summer 2009), pp. 113-146. For a broad overview of the evolving precision-strike regime, see Thomas G. Mahnken, “Weapons: The Growth and Spread of the Precision-Strike Regime,” Daedalus, 140, No. 3 (Summer 2011), pp. 45-57. Ron Christman, “Conventional Missions for China’s Second Artillery Corps: Doctrine, Training, and Escalation Control Issues,” in Andrew S. Erickson and Lyle J. Goldstein, eds., Chinese Aerospace Power: Evolving Maritime Roles (Annapolis, Md. : Naval Institute Press, 2011), pp. 307-327. Dennis Gormley, Andrew S. Erickson, and Jingdong Yuan, “China’s Cruise Missiles: Flying Fast Under the Public’s Radar,” The National Interest web page, May 12, 2014. Office of the Secretary of Defense, Annual Report to Congress: Military and Security Developments Involving the People’s Republic of China (Washington, D.C.: Department of Defense, 2014), p. 40. Ibid., p. 9; and Zachary Keck, “Can China’s New Strategic Bomber Reach Hawaii?” The Diplomat, August 13, 2013. Mark Stokes, China’s Evolving Conventional Strategic Strike Capability: The Anti-Ship Ballistic Missile Challenge to U.S. Maritime Operations in the Western Pacific and Beyond (Arlington, Va.: Project 2049 Institute, September 14, 2009), pp. 33-34. Lora Saalman, “Prompt Global Strike: China and the Spear,” Independent Faculty Research (Honolulu, Hi. : Asia-Pacific Center for Security Studies, April 2014), p. 12. Office of the Secretary of Defense, Annual Report to Congress: Military and Security Developments Involving the People’s Republic of China, p. 30. William Yengst, Lightning Bolts: First Maneuvering Reentry Vehicles (Mustang, Okla.: Tate Publishing & Enterprises, LLC, 2010), pp. 111-125. Jonathan Greenert and Mark Welsh, “Breaking the Kill Chain,” Foreign Policy, 16 May 2013; and Department of Defense, Joint Operational Access Concept (JOAC) Version 1.0, January 17, 2012, p. 16. T.X. Hammes, “Offshore Control: A Proposed Strategy,” Infinity Journal, Vol. 2, No. 2 (Spring 2012), pp. 10-14. Christman, “Conventional Missions for China’s Second Artillery Corps,” pp. 318-319. Stephen G. Brooks, G. John Ikenberry, and William C. Wohlforth, “Lean Forward: In Defense of American Engagement,” Foreign Affairs, Vol. 92, No. 1 (Jan-Feb 2013), p. 130. Sydney J. Freedberg Jr., “The Limits Of Lasers: Missile Defense At Speed Of Light,” Breaking Defense, May 30, 2014. Sam Jones, “MoD’s ‘Quantum Compass’ Offers Potential to Replace GPS,” Financial Times, May 14, 2014. Office of the Secretary of Defense, Annual Report to Congress: Military and Security Developments Involving the People’s Republic of China, p. 29. This is the first of these pieces that I think could be a realistic game changer for the U.S. There is another possible response to a Chinese attack not considered here, and that is the nuclear response. The nation has never been attacked this way. Never. By an enemy that was not at immediate risk during the attack. Could it be that our response would be nuclear attacks on China? Is that possible? Is it conceivable? I think it is. An attack on West Coast military or power generation sites? San Onofre nuclear power plant? Is it not possible that the nation would rise up and demand a nuclear response to such a thing? It’s not the sack of Rome here….but then again, maybe it has the same effect. The sack of Rome resulted in a millennia of “Dark Ages.” Would a nuclear attack on China in response to a dramatic conventional attack on the U.S. not be something similar? I enjoyed this article, particuarly given that its close to my area of research on Chinese military modernisation. I think the one area where I differ from the author is the idea that Chinese conventional strikes against the US mainland would shatter US resolve. I think quite the reverse. The American people probably would not be that fired up about fighting China over the Senkakus – uninhabited rocks in the East China Sea – but if as a result of a conflict with China, Beijing launched kinetic strikes against the US mainland, that would be another ‘Pearl Harbour’ moment. particuarly if the Chinese launched such strikes at the outset of a conflict. It would make little sense to delay them. Such attacks would galvanise the US population – or to paraphrase Isoroko Yamamoto – all it would do is awaken a sleeping giant and fill him with a terrible resolve. So the only protests on US streets would be against China – not against the US government. Nor do I think the US would face the choice of defeat or nuclear escalation. Such attacks might galvanise the US into considering alternative approaches besides Airsea Battle that do not have to necessarily involve nuclear weapons. A greater focus on Offshore Control might be one possibility. Interdicting Chinese energy flows via land-based pipelines in Burma, Pakistan and Central Asia might be another. Or a ‘blockade at source’ – cutting the oil and resources by blockading ports from which China’s energy flows out of in the Middle East and Africa. Hitting Chinese energy reserves within mainland China as well. This would make a powerful coercive strategy albeit for a long war. If the US was going to use nuclear weapons, a smarter approach than nuking cities would be a series of graduated EMP attacks high above China to wipe out its command and control. Such attacks could be done in a manner that held open the prospect of further EMP attacks directed against China’s economy. Such attacks would kill no one, nor cause any physical damage, but would raise the cost of China continuing the war, threatening economic growth and thus social stability, and with it undermining the legitimacy of CCP rule. I think the Chinese – facing the loss of a modern information-led economy, and with it, their ability to stay in power, would seek a negotiated settlement. Of course – the counter to my argument in this regard is that the Chinese might retaliate with their own nuclear EMP attacks – and both sides end up with pre-industrial era economies. Mutually Assured Economic Destruction. That’s a risk. But I’d prefer that risk to MAD by actually nuking Chinese cities or military targets. There are several things we need to look at here, and I think you hit upon most of them. First of all, this would strengthen U.S. resolve to a level we haven’t seen since 9/11. Second, while I don’t think that we would escalate to a nuclear exchange simply because the weapons were launched, there would have to be some pre-war “agreements” in place to avoid the type of confusion that coule lead to an accidental nuclear exchange. Since they use an ICBM to launch the weapons, unless the missiles were based in a declared area clearly set aside for these weapons and ONLY these weapons, you could easily confuse them for nukes. (This is the problem we keep running into with Prompt Global Strike, IIRC). If you have your weapons in this controlled zone, it makes it easier for me to interdict and kill them before you use them. Additionally, the cost/benefit isn’t really clear to me unless you have a weapon that would have much more impact than described in the piece. I can see the benefit of the DF-21 ASBM, but this system is harder to justify unless you’re using it to target key command and control sites. I think the idea of declaring an area for launching HGV carrying ICBMs is problematic in terms of monitoring and verification. There would be an incentive for both sides to cheat in order to prevent the rapid loss of such weapons to countermeasures or attack from stealthy platforms. There would also be concerns about whether the combatants would place nuclear ICBMs in such areas to protect them from attack. Also, how do we know how many HGVs the Chinese might have kept away in underground hardened facilities? Fantastic article and great follow up comments from Mr. Cronin and Dr. Davis. It is hard to say what the response from the U.S. may be to strikes on the homeland, as Dr. Davis alludes. We also saw how the U.S. responded to a more recent attack – Sept. 11. But even the threat of conventional strikes changes the decision calculus of policy makers, something Mr. Sugden alludes to. Elected officials may feel pressured to not interfere in future Chinese aggression for fear of potential strikes and the unknown ramifications. The author suggests some possible mitigations. Interestingly, China is pursuing many of those same tactics to harden their infrastructure against us.. I think conversely the logic of Mr. Davis could be used in reverse to argue strongly against the US striking the Chinese mainland in response to local Chinese aggression as part of Air/Sea Battle. US planners seem to assume that they will strike targets on the Chinese coast in response to an attack, and this to me seems foolhardy. The Chinese have public sentiment as well, and a US attack on Chinese soil could lead to the situation escalating rapidly in short order. A blockade of some type seems like a much more reasonable US response, and plays to US strengths. If the Chinese were to respond by striking the US homeland, then they would prove themselves not nearly as rational as the Soviets in 1962. Let’s hope that never happens. Well put. Of course US strikes against China as part of a ‘blinding campaign’ in AirSea Battle runs the risk that the Chinese will see any attack on their mainland as their ‘day of infamy’, and respond accordingly. That’s got to be a big risk. However would they escalate to nuclear weapons? I don’t think its axiomatic they would. If we began hitting their nuclear forces directly, or striking key C2 systems rapidly such that they could not employ their nuclear weapons, they might be tempted (‘use them or lose them’), but they’d have to realise that the US would retaliate, and in the end, neither side would win. I think it more likely that the Chinese will respond to AirSea Battle by hardening and dispersing their C2, and relying more on mobile nuclear weapons – road-mobile ICBMs like the DF-41, and building up their second-strike capability via SSBNs – than accepting the rapid loss of their nuclear forces to conventional attacks. They would also be likely to invest more in air and ballistic missile defences – particuarly with sensors based on long-wavelength radar that can detect stealth aircraft – and they could think again about MIRVs. Putting more warheads on one missile, which could then be destroyed by conventional strikes, does not make much sense. Better to build more single warhead, road mobile ICBMs and IRBMs, which can quickly disperse across China and be hard to find. The US had a great difficulty in undertaking ‘Scud Hunting’ during the 1991 Persian Gulf War – hunting lots of road-mobile ICBMs across a vast, heavily defended territory like China would be several orders of magnitude greater. In terms of blockade, and ‘Offshore Control’ I agree its a viable strategy compared to the AirSea Battle Operational Concept. I’m not convinced AirSea Battle will work as advertised. Offshore Control however can pose serious coercive pressure on Beijing that they cannot easily counter. the title of this article should be, us’s conventional strikes against the china homeland. The danger from hypersonic glide vehicles is that, were such weapons ever detected to be en route to American soil, there is not a chance any sane president would wait to find out what sort of warheads they carried without ordering retaliation. Whether these weapons bear NBC or conventional warheads is of no consequence to military and political decision makers; they would immediately engender an escalatory response.